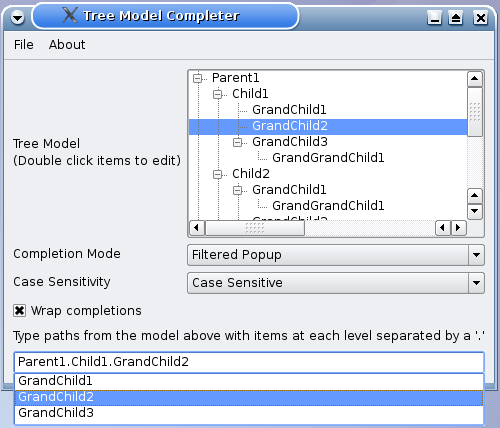 The Tree Model Completer example shows how to provide completion facilities for a hierarchical model, using a period as the separator to access Child, GrandChild and GrandGrandChild level objects. Similar to the Completer Example, we provide QComboBox objects to enable selection for completion mode and case sensitivity, as well as a QCheckBox for wrap completions. The TreeModelCompleter is a subclass of QCompleter with two constructors - one with parent as an argument and another with parent and model as arguments. The class reimplements the protected functions splitPath() and pathFromIndex() to suit a tree model. For more information on customizing QCompleter to suit tree models, refer to Handling Tree Models. TreeModelCompleter also has a separator property which is declared using the Q_PROPERTY() macro. The separator has READ and WRITE attributes and the corresponding functions separator() and setSeparator(). For more information on Q_PROPERTY(), refer to Qt's Property System. The first constructor constructs a TreeModelCompleter object with a parent while the second constructor constructs an object with a parent and a QAbstractItemModel, model. The separator() function is a getter function that returns the separator string. As mentioned earlier, the splitPath() function is reimplemented because the default implementation is more suited to QDirModel or list models. In order for QCompleter to split the path into a list of strings that are matched at each level, we split it using QString::split() with sep as its separator. The pathFromIndex() function returns data for the completionRole() for a tree model. This function is reimplemented as its default implementation is more suitable for list models. If there is no separator, we use QCompleter's default implementation, otherwise we use the prepend() function to navigate upwards and accumulate the data. The function then returns a QStringList, dataList, using a separator to join objects of different levels. The MainWindow class is a subclass of QMainWindow and implements five custom slots: about(), changeCase(), changeMode(), highlight(), and updateContentsLabel(). In addition, the class has two private functions, createMenu() and modelFromFile(), as well as private instances of QTreeView, QComboBox, QLabel, TreeModelCompleter and QLineEdit. The MainWindow's constructor creates a MainWindow object with a parent and initializes the completer and lineEdit. The createMenu() function is invoked to set up the "File" menu and "Help" menu. The completer's model is set to the QAbstractItemModel obtained from modelFromFile(), and the highlighted() signal is connected to MainWindow's highlight() slot. The QLabel objects modelLabel, modeLabel and caseLabel are instantiated. Also, the QComboBox objects, modeCombo and caseCombo, are instantiated and populated. By default, the completer's mode is "Filtered Popup" and the case is insensitive. We use a QGridLayout to place all the objects in the MainWindow. The createMenu() function sets up the QAction objects required and adds them to the "File" menu and "Help" menu. The triggered() signals from these actions are connected to their respective slots. The changeMode() function accepts an index corresponding to the user's choice of completion mode and changes the completer's mode accordingly. The about() function provides a brief description on the Tree Model Completer example. QMessageBox::about(this, tr("About"), tr("This example demonstrates how "
The changeCase() function alternates between Case Sensitive and Case Insensitive modes, depending on the value of cs. The main() function instantiates MainWindow and invokes the show() function to display it.